The Papal Basilica of Saint Peter in the Vatican, officially known in Italian as Basilica Papale di San Pietro in Vaticano and commonly known as Saint Peter's Basilica, is a Late Renaissance church located within Vatican City. 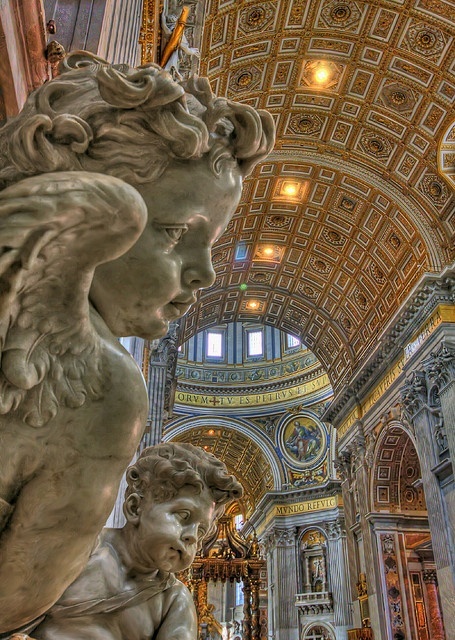 Designed principally by Donato Bramante, Michelangelo, Carlo Maderno and Gian Lorenzo Bernini, St Peter's is the most renowned work of Renaissance architecture and remains one of the largest churches in the world. While it is neither the mother church of the Roman Catholic Church nor the cathedral of the Bishop of Rome, Saint Peter's is regarded as one of the holiest Catholic sites. It has been described as "holding a unique position in the Christian world" and as "the greatest of all churches of Christendom". In Roman Catholic tradition, the basilica is the burial site of its namesake Saint Peter, one of the twelve apostles of Jesus and, also according to tradition, the first Bishop of Rome and therefore first in the line of the papal succession. Tradition and some historical evidence hold that Saint Peter's tomb is directly below the altar of the basilica. For this reason, many Popes have been interred at St Peter's since the Early Christian period. There has been a church on this site since the 4th century. Construction of the present basilica, over the old Constantinian basilica, began on 18 April 1506 and was completed on 18 November 1626.